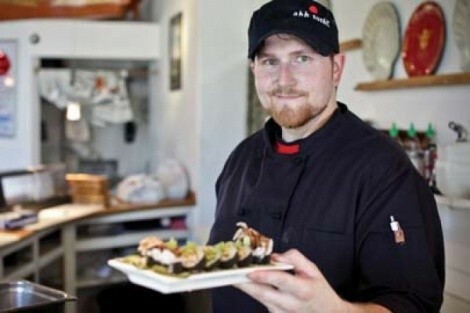 Daniel Linder started as a door guardian and three years later is now the kitchen manager at Ahh Sushi! in Park City (8178 Gorgoza Pines Road, Park City, 801-658-0233). He shares his evolution as a sushi chef with City Weekly. What sets your sushi restaurant apart from the rest? Hidden here in Jeremy Ranch, a quiet little suburb just over the summit between Salt Lake City and Park City, lies a quaint li’l sushi bar with some of the best talent in the state working side by side. Our fish is extremely good, along with all of our ideas. We’re sitting here waiting for the next patron to discover our awesomeness. When did your love of fish first develop? Ever since my nana introduced me to some classic English fish & chips. Dear nanny knows best! Do you have any formal culinary training? I have been fortunate to learn from some of the best sushi chefs in Salt Lake City. I started out under Master Chef Ferrer and am now getting to learn from the O.G. of SLC, sushi grand master Drew Lang! He’s been around the sushi scene for years and always pushes me to do my best, try new things, get daring and put it all out on the bar. I owe a lot to both these guys. Money, and I do that by making smiles. It fills me with joy to see people having mouth orgasms when they eat my creations. What are the perks of being a chef? I like the creative aspect most. I get to make new exciting dishes every day. I’m not cut out for the 9-to-5 office paper-pushing routines. Being a chef is definitely a lifestyle choice, and if it wasn’t for the fact that I get to make new edible art every day, I would have subconsciously lost this job a long time ago. Tell us a fish tale. What is the funniest sushi mishap you’ve had? When I first started doing sushi, I had the misfortune of cutting the tip of my finger off. In the panic of the moment, I grabbed it and threw it away, mistaking it for a piece of ginger. It’s OK, though—my mishap and deformity adds character. Do you have any advice for other aspiring sushi chefs? Always keep your knives sharp.